Ramaphosa calls for private sector's mutually beneficial partnerships - SABC News - Breaking news, special reports, world, business, sport coverage of all South African current events. Africa's news leader. President Cyril Ramaphosa has called on the private sector to form mutually beneficial partnerships with government to boost the development of infrastructure in Africa. 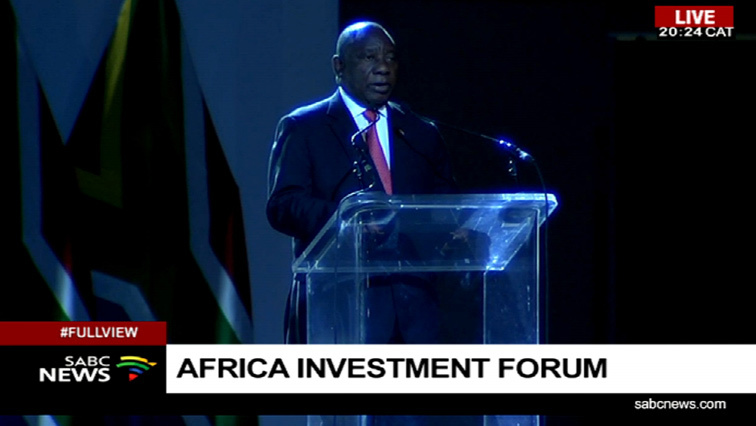 He was addressing delegates at the African Investment Forum under way at the Sandton Convention Centre in Johannesburg. Leaders of African states as well as a number of executives of companies are attending the Forum which is focusing on seeking ways of growing the economies of African countries and attracting investment to the continent. ” Africa will not be able to raise the 130 billion or more that it needs each year to meet its infrastructure requirements without massive private sector investment in the development of the continent. Government and the private sector should form relationships of mutual benefit because Africa holds significant and untapped potential for many investors,” President Ramaphosa explained. Ramaphosa says sound policies and clean governance are crucial for making Africa an investor-attractive continent. The aim of the the three-day gathering is to accelerate Africa’s investment opportunities. African heads of state and a number of chief executive officers are attending the Forum. Ramaphosa says financial institutions on the continent need to be strengthened to attract investment. The forum, convened by AfDB Group, brings together public and private sector investors to invest in Africa’s infrastructure. This entry was posted on 07 Nov 2018,10:03PM at 10:03 PM and is filed under Africa, News, Homepage Featured Story Slider. You can follow any responses to this entry through the RSS 2.0 feed. Both comments and pings are currently closed.